Walter Blume designed the Arado Ar 95 in 1935 for the coastal patrol, reconnaissance and light attack role. 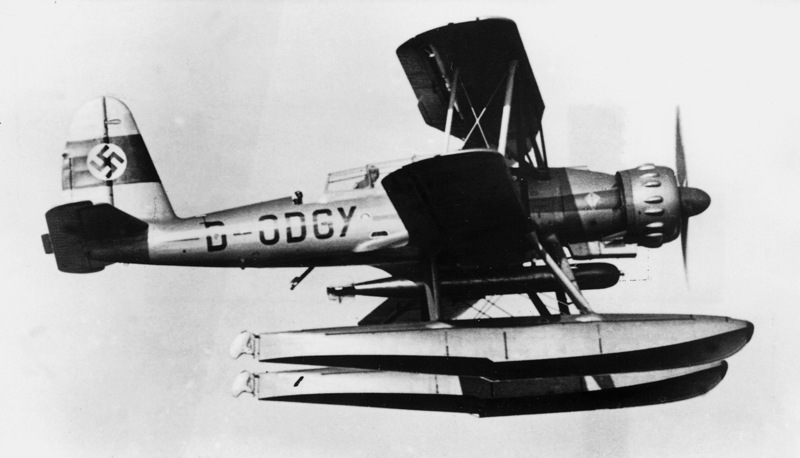 It was a two-seat biplane with metallic fuselage and rear-folding wings. The wings had a metal structure, with the top one skinned in metal and the lower one in canvas. The prototype(Ar-95 V1) first flew during 1937, fitted with a Junkers Jumo V12 engine of 455kW (610hp). Several prototypes tested successive modifications such as enlarged tail surfaces, a closed cockpit and a change to the 630kW (845hp) radial BMW 132 engine. The Ar-95 V3 was a three-seat version and the Ar-95 V4 had a fixed and spatted wheeled undercarriage. While the prototypes were still being tested, a pre-production run was started and several served in Spain with the Condor Legion. A small number were later in front-line Luftwaffe service early in the war before being relegated to training duties. The Ar-95A version had the BMW 132DC engine of 657kW (880hp) and a variable-pitch three-bladed propeller. The armament was a single fixed forward-firing MG15, mounted on the fuselage to fire through the propeller, and another MG15 on a flexible mounting to the rear. Under-fuselage it could carry a 700kg (1540lb) torpedo or a 375kg (825lb) bomb; under each wing 50kg (110lb) bombs. Chile bought six – three Ar 95A floatplanes and three wheeled-version Ar 95Bs.